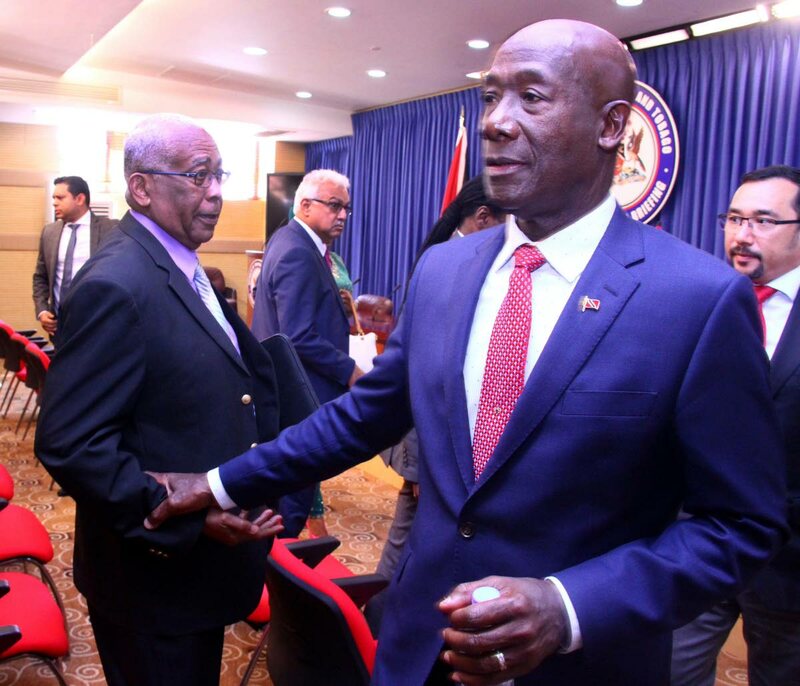 PM Dr Keith Rowley greets Anthony Garcia, Education Minister, after addressing members of the media, about his official visit to China and Australia, Diplomatic Centre, St Ann’s. Tuesday, May 30. PRIME Minister Dr Keith Rowley announced on Tuesday that Government is looking to acquire new fast ferries for the seabridge and at least one new patrol boat for the Coast Guard from Australia. Rowley made the announcement at a news conference at the Diplomatic Centre in St Ann’s. He also disclosed the discovery of documents which showed government employees never revealed that Australian shipbuilder Incat could have supplied ferries to allow the TT Spirit and TT Express to drydock for scheduled maintenance. Saying Incat and another Australian company, Austal, will be invited to present proposals for ferries, Rowley said Cabinet should receive the first proposal within two weeks. With a high worldwide demand for fast ferries, Rowley said it is possible to sell the TT Express and TT Spirit. He added this would not result in the seabridge having no passenger ferries. He said whoever obtains the Spirit and the Express would, “lease them back to us, just so we get them until we get our new vessels.” Money from the sale of the Spirit and Express would be used to help pay for the new ferries. Condemning the former People’s Partnership (PP) government for running six fast patrol boats from Austal into the ground, Rowley said Government is seeking to acquire at least one Cape Class patrol boat for the Coast Guard. One of the Australian Navy’s top vessels, the Cape Class’ features include the ability to undertake 28 day patrols, sail 4,000 nautical miles without refuelling and combat a full range of maritime security threats. This vessel will work alongside 12 Damen patrol craft and a Chinese frigate to bolster TT’s maritime security. Rowley said this was particularly critical off the south coast where several of TT’s economic assets are located. “Those who told us that our borders are not to be defended at sea did us a great disservice and the chickens are now home to roost,” he declared. With an Austal team due next week in TT to report on the six patrol boats, Rowley said those vessels would be repaired and put back into service. TT Defence Force Chief of Staff, Commodore Hayden Pritchard, was a member of Rowley’s delegation on his visits to China and Australia. Reply to "Govt must place order now"